The first full week of fall begins today, but it still does not feel like it. By this weekend though, look for a cold front to change that. Today and Tonight: Area thermometers will stretch for 90 degrees on today with humidity remaining in place. A few showers and thunderstorms will be possible during the afternoon, although rain coverage should not exceed 30 percent. Tonight will be mostly clear with low temperatures in the low 70s. Up Next: Rain chances will continue to trend down through Tuesday and the middle of the week will be mostly clear and unseasonably warm with highs in the low 90s. By this weekend though, an actual cold front will pass across the area. Now, don't expect a dramatic difference in temperatures, but there will be a noticeable change. The biggest difference will be a drop in humidity. This will allow overnight temperatures to fall into the mid 60s while afternoon temperatures remain in the mid 80s. The front is not expected to bring much in the way of rain. 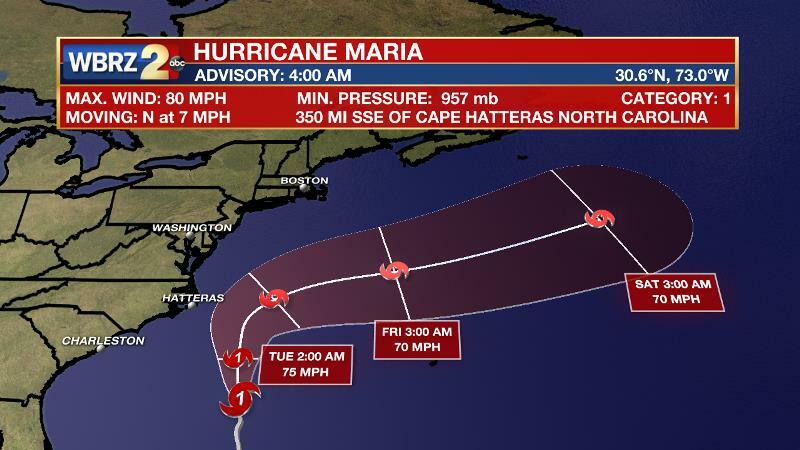 The Tropics: Hurricane Maria is positioned 350 miles southeast of Cape Hatteras with a minimum central pressure of 957mb and maximum sustained winds of 80mph moving north at 7mph. Tropical Storm conditions are expected in parts of eastern North Carolina and storm warnings have been posted for the Outer Banks. 2-4 feet of storm surge, 1-2 inches of rain and wind gusts over 40mph will be possible Tuesday and Wednesday. Lee has regained hurricane status as a category one in the Central Atlantic. Going nowhere fast, Lee will remain a fish storm, eventually curving out to sea. A weak upper level trough over the central Gulf Coast will continue to trigger showers and thunderstorms through Tuesday. Rain coverage will not exceed 30 percent across the 13 Parish, 3 County forecast area. The best chances will be south and east of Baton Rouge, closer to the coast. By Wednesday, the trough will be replaced by mid-level ridging effectively shutting down convection. A mid-level ridge will dominate through Thursday and associated subsidence will lead to much warmer than average temperatures. Highs will be well into the low 90s both days. 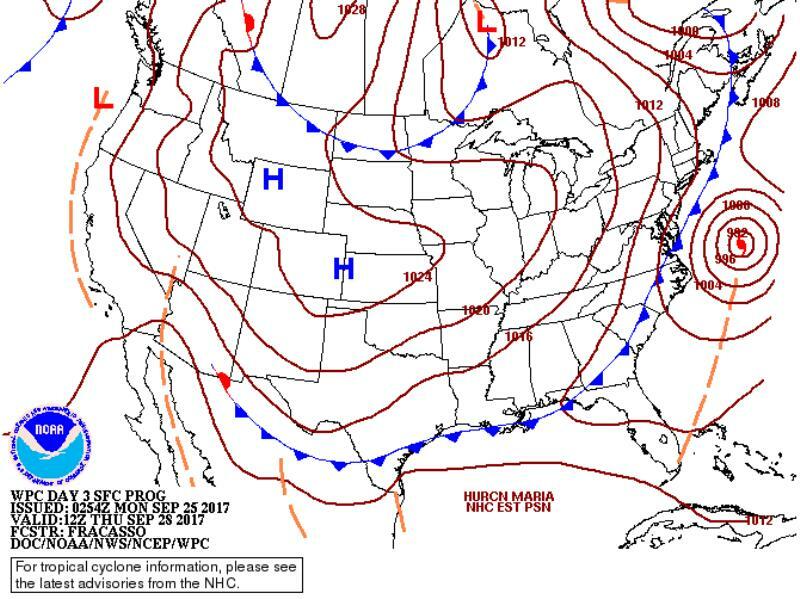 ON Thursday, a shortwave trough digging through the Eastern U.S. will send a weak cold front toward the Gulf Coast. This front will be moisture starved, but will be followed by some lower dew points. By Friday, humidity will be reduced. The dry air will stay in place with high and low temperatures down about 5 degrees for the upcoming weekend.